I help a broad variety of riders understand, enjoy, utilize dressage in their pursuit of good horsemanship in any discipline. 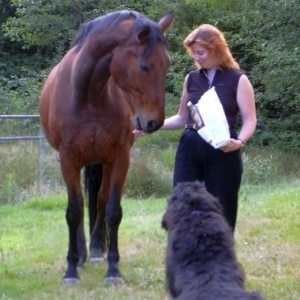 I specialize in making complex dressage concepts simple, developing happy horse and rider partnerships. I offer board at a beautiful facility, lessons and training. Credentials: As an instructor, Kellie has successfully coached many riders – Adult amateurs and young riders to local and regional championships. USDF Bronze medalist and “L” judging graduate. Past Equestrians Institute Board member and Dressage Director. National/Regional show secretary and show manager. 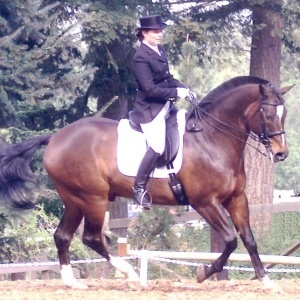 Certified Dressage Instructor (Training thru FEI) through the Positive Riding Program. A program designed to give instructors a classical system with the theory and information to progress through the levels while developing their own teaching style. Indepth coverage of transition, frames, half-halts and exercise for developing the horses’ topline, balance and understanding of the aids. Teaches riders and instructors to think about what they are doing and why! Includes lungeing, in-hand work and long-lining. Graduate from the University of Washington with a double-major in Sociology and Psychology. Background in Society and Justice. Criminal investigator with Seattle-King County for several years. Kellie has trained with: Henrik Johansen, Janet Foy, Diana Mukpo, Ulla Boysen and assorted other local instructors. Has audited extensively with Klaus Balkenhol, Debbie McDonald, Steffen Peters, and Shannon Peters. Klaus Balkenhol : There is a difference between being a leader and being a boss. Both are based on authority. A boss demands blind obedience; a leader earns his authority through understanding and trust.